There are numerous products on the market which are labelled “Ginkgo Forte”. These products all feature a blend of Ginkgo biloba along with other ingredients that support the effects of this natural memory-boosting supplement. Standard Process, Ginkofar Forte, VitaHealth, Santegra Formata, ISA Laboratories, Blackmores, Ginkoflav Forte N60 and a number of other companies all market products under this name. It is important to distinguish between the dosages and ingredients in each of the Ginkgo Forte supplements so that you buy the best supplement for your needs. 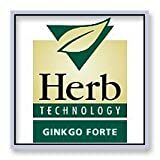 One of the popular brands of Ginkgo Forte is the product sold by Herb Technology. This supplement is promoted for memory, improving absent-mindedness, and long-term support for brain and nerve functions. Why Use Gingko Forte Supplements? Ginkgo biloba is one of the most popular herbal dietary supplements sold today. Studies have demonstrated that it can improve memory and cognitive function by increasing blood flow to the brain. This results in increased oxygen utilization within brain cells, allowing your neurons to generate more energy. The result is increased alertness, improved neural health, and better mental performance. Some studies have found that Gingko may modestly improve symptoms of Alzheimer’s and dementia , including improving some measures of cognitive function and social functioning. Using a daily Ginkgo Forte supplement is promoted as a way to keep your brain healthy and potentially slow down signs of aging. VitaHealth provide a Ginkgo Forte product which is a ginkgo and panax ginseng blend. This combination is popular in most product ranges and is available under a variety of different names. Ginkgo and ginseng appear to work well together and poor reviews are few. The ginkgo improves circulation and consequently mental function, while the ginseng, in its capacity as an adaptogen, works to maintain overall homeostasis. Tebonin Ginkgo Forte is processed in a different way to other commercial products. Tebonin is one of only two ginkgo extracts to be approved for use in clinical trials. The reason it is different is that the extract contains no biflavoids. Biflavoids are thought to possibly interact with any ginkolic acid which remains in the extract and therefore reduces efficacy. By keeping levels of ginkolic acid well within the safe levels (5 parts per million) and also extracting the biflavoids, the product is deemed to be more effective than most. Tebonin is more often referred to in clinical trials as EGb 761. This ginkgo extract has provided more significant results than any other extract used in research. However, the process of removing the biflavoids is expensive and reflected in the price of the product. Tebonin Ginkgo Forte is sold in a 40mg capsule. For 200 capsules the price is around $85. This averages out at $0.42 per dose. The recommended dosage is only 1 capsule per day, so the original cost is offset by a reduced daily dosage comparative to most products. The Standard Process Ginkgo Forte product contains not only ginkgo but also calcium. The ginkgo is standardized to 14.4mg flavonglycosides and 3.6mg of ginkgolides and bilobalide. Total ginkgo is measured at 60mg. The calcium level states 80mg. However it does not state the type of calcium used. The capsules cost around $0.36 per dose. Recommended dosages are from 1-4 capsules daily which, when compared to the Tebonin dosage, can work out to be substantially more expensive. Blackmores Ginkgo Forte contains ginkgo in a single-ingredient formulation. It provides a high dosage, equivalent to 2,000mg of dry leaf. At $20.49 for 40 tablets the dosage costs are $0.51. The recommended dosage rate is 1-3 tablets daily. The individual cost per capsule multiplied by a suggested daily dosage can become more costly than would first appear. ISA Laboratories based in Argentina provide a Ginkgo Forte which not only includes 80mg of ginkgo but also a combination of B Vitamins. They have included 3g each of vitamin B1 (Thiamine), B2 (Riboflavin), and B6 (Pyridoxine). Vitamin B1 helps the brain function better by metabolizing glucose. Vitamin B2 helps the body release energy from carbohydrates and keeps the skin in good condition. Vitamin B6 helps with the synthesis of certain neurotransmitters and both red and white blood cells. All the vitamins included in this Ginkgo Forte product help to enhance the effects of Ginkgo biloba. They are meant to support the nervous system and provide additional assistance with cellular issues relating to skin health and blood condition. Although some B vitamins are produced in the body, these are not normally available to the body to use. Therefore all B vitamins (like all vitamins) are obtained from external factors. Not all products with the name Ginkgo Fortes are the same. In fact it would appear that no two are alike. There are many other Ginkgo Forte products worldwide. They are produced in countries such as Hungary, Poland and many more. More commonly recognized brands in the English speaking world are those sold by VitaHealth, Standard Process, and Blackmores. When purchasing Ginkgo Forte you are not purchasing a standardized product and formulations vary greatly among manufacturers. It is important to consider the ingredients for yourself to determine which synergistic combination is best for your needs. Expect to pay at least a little extra for Ginkgo Forte brands than most commercial blends.